John Ronald Reuel Tolkien was born in the Orange Free State on 3 January 1892, but his widowed mother brought him back to Birmingham as a child. He went up to Exeter College, Oxford in 1910, and returned to Oxford briefly after the First World War to work for the Oxford English Dictionary, and then in 1920 took up an academic appointment at the University of Leeds. In 1925 he was appointed Professor of Anglo-Saxon at the University of Oxford, attached to Pembroke College, and in January 1926 he moved with his family to 22 Northmoor Road in Oxford. In January 1930 they moved next door to 20 Northmoor Road, and the house has a blue plaque. In 1937 he wrote The Hobbit there. In 1945 Tolkien was appointed to the Merton Chair of English language and literature (which he held until his retirement in 1959). He moved out of 20 Northmoor Road in about 1947, and in 1949 he was living at 3 Manor Road. In about May 1950 he moved with his family to 99 Holywell Street. In 1953 he moved to 76 Sandfield Road, Headington (below), where he lived from 1953 to 1968. Tolkien worked in the garage on the left of this photograph, and over its door there is this inscribed Portland stone plaque, which was carved in the 1970s by Bill Brown of Kidlington for the then owner, Mr Phillips. He was a Roman Catholic, and while living in Sandfield Road worshipped at St Anthony of Padua Church in Headley Way. 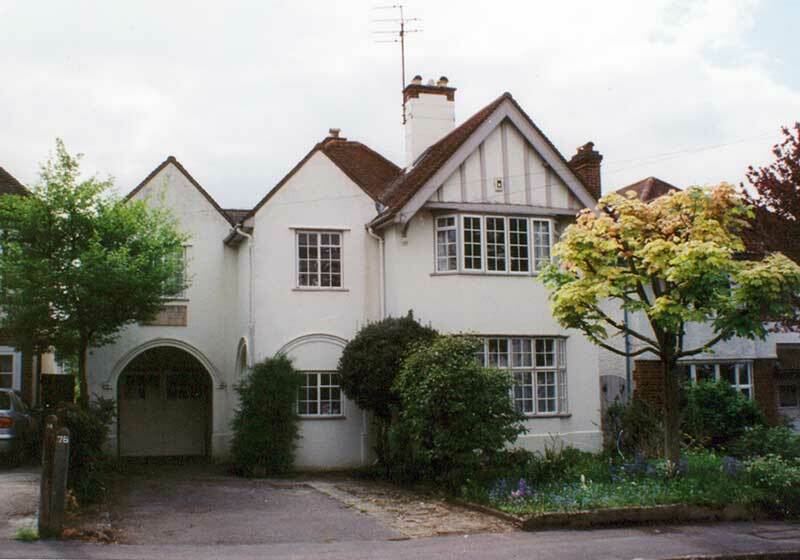 In 1968, the attentions of the fans of The Hobbit and The Lord of the Rings at his home at 76 Sandfield Road drove Tolkien to flee from Headington to Bournemouth. After the death of his wife on 29 November 1971 he returned to Oxford to live in rooms provided by Merton College. Tolkien died while paying a visit to a friend back in Bournemouth on 2 September 1973 and was buried in his wife's grave at Wolvercote Cemetery in Oxford. A requiem mass was held for him at St Anthony of Padua Church on 6 September 1973.